The Jokers of Doom got a boost from its newest member Steve Looze in a 2-0 shutout win over Pure Chaos. 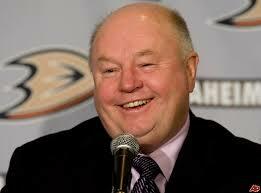 Looze scored the first goal just 27 seconds into the second period after a scoreless first. 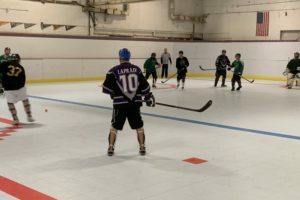 After a blast from the circle by Ken Herren was stopped by the goalie, Kevin LaPrade picked up the rebound and slid a pass over to Looze between the circles who ripped home a quick wrist shot. After two periods the Jokers were holding tightly to the 2-1 lead and held the shot advantage 15-11. In the third Rob Kurdy would deflect home an insurance goal off of a flicked pass toward the front of the net, assists went to Jeremy Battye and Looze. Goalie Greg Benoit would turn away all 6 Chaos shots in the 3rd with 17 saves in total to grab his first shutout as a Joker. Notes: Defenseman Mike Bradigo also made his season debut for the jokers… Captain Jim Brunetti remained sidelined with a foot injury, he is probable for the next game… John Condit and Frank Melillo missed the contest for unspecified reasons. The Jokers of Doom failed to keep the momentum going after their season opening 4-2 win, coming up short versus the Vipers 3-2 behind a hat trick from John Venditti. Venditti opened the scoring with a wicked slap-shot after he was left open from the top of the right circle. The Jokers would tie the game on the power play with a long slap-shot from Ken Herren that found it’s way past ex-Jokers goalie Matt Chapman. Unfortunately Venditti nabbed his second goal as he weaved around a couple of defenders to slide home a partial breakaway goal before the first period would end for a 2-1 lead heading to the second. In the second Venditti would get his 3rd and eventual decisive goal on a power play blast from the point. There would be no further scoring in the second period as both teams pushed with double digit shots on goal but no goals. The final period would continue with many shots but no goals until Phil Elliott broke through with a long wrist shot that found it’s way to the back of the net. As time wound down the Jokers were unable to pull their goalie for the extra attacker until there were only a few ticks left and were unable to generate pressure or a goal in the late stages. Notes: The Jokers will next face Ray Glowicki and the 1-0 Pure Chaos on Thursday evening… Frank Melillo and leading score Jeremy Battye were not in the lineup… Greg Benoit played well stopping 28 of 31 shots but falls to 1-1 along with the Jokers… Defenseman Aaron Duncan takes the early PIM lead with 2 penalties in the game. The Jokers of Doom opened the spring season with a 4-2 win highlighted by Jeremy Battye’s hat trick. Battye opened the scoring with a goal at 2:25 assisted by Phil Elliott. Then with only 3 seconds left in the first period Kevin LaPrade banged home another goal, assisted by John Condit. In the second the Tomahawks would net a tip in goal just 34 seconds into the period. However with 1:46 left Battye would pick off a pass and score on a breakaway pushing the lead back to two goals at 3-1. Finally in the 3rd the Tomahawks again would push closer with a goal at the 2:57 mark after the Jokers were unable to clear the zone. With time winding down the Tomahawks pulled their goalie looking for a tie but Battye would come up with the ball at mid court and fire a wrist shot into the empty net for his 3rd goal and secure the 4-2 win. The Jokers won’t have much time to enjoy the win – game two of the season is scheduled for Thursday at 7:00pm. The first period was marred by what could be a major injury to captain Jim Brunetti who hurt his left foot/heel. He was scheduled for an evaluation after the game. Winger Kristie Rochette, and defensemen Jim Salkins and Aaron Duncan were unavailable for game one. New Jokers goalie Greg Benoit stopped 31 of 33 shots for the win. Jokers backup goalie John Deluca was called upon to man the net after a late scratch of starter Matt Chapman. Deluca was up for the task as he stopped 20 of 23 shots en route to a hard fought 4-3 first round playoff win for the Jokers of Doom hockey club over the Tomahawks. Also scratched for this game was the Jokers top goal scorer Graig Romberg and center Frank Melillo. Jeremy Battye stepped in and paced the offense with with a goal and 3 assists. The first period ended with a 1-0 Jokers lead on a goal by Phil Elliott. In the second the Jokers would extend the lead to 3-0 on goals by Battye and Ken Herren before the Tomahawks would put in a floater shot from the point past Deluca who was screened by a lot of traffic in front of the net. In the 3rd period a delayed penalty was about to be called on the Tomahawks less than a minute into the period however Battye found a wide open Jim Brunetti in front of the left side of the net and he found pay dirt with a quick wrist shot past the keeper. 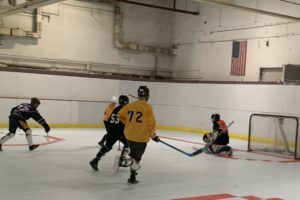 The Jokers would then hold on for dear life as the Tomahawks would score a goal with 3 and a half minutes remaining and another late goal at the 1:32 mark but after that they could not get the tying goal and the Jokers would emerge victorious. The Jokers will next face Hockey Balboa on Saturday afternoon with a trip to the finals on the line. Jokers of Doom are back for the fall season and came up short in the opener by a score of 6-5. The roster needed an overhaul after the team was unable to secure the return of the Salkins family, John Condit, or speedster Josh Berrelli. Also not returning due to injuries are Kevin LaPrade and defensemen Paul Bellantuono. The team was able to secure the return of Graig Romberg, Phil Elliott, John Deluca, and Jeremy Battye as well as Alix Langlais coming back from an injury. Andy Pettola will also return in the nets but was absent for the opener with backup duties falling to John Deluca. The Jokers opened against Hockey Balboa and while they were able to strike first in the opening minutes on a goal from ex-Joker Dave Dreschler, the Jokers would fight back with goals by Romberg (power play) and Battye to end the first with a 2-1 lead. In the second although the shots were even at 11 per team, Balboa would gain the edge scoring 2 goals and taking a 3-2 lead into a frenzied final period of play. The third period again had 11 shots per team but 6 goals were scored between the two teams. The Jokers would nab the first 2 scores with Battye and Romberg each scoring their second goals of the game, including a wicked snap backhander into the top of the net by Romberg. The momentum would be short lived however as Balboa would click off 3 straight goals over only 1-1/2 minutes starting with a disputed goal. Dreschler’s second goal of the game ricocheted off his upper body and squirted past Deluca. The Jokers argued for a forward motion deflection and the goal should be nullified. The referees conferred and decided the goal was good. Balboa would add two more goals and although Romberg did get the hart trick with his 3rd goal, the Jokers team couldn’t recover and get the tying goal with the extra attacker in the final minute. The Jokers will next tangle with 0-1 Tomahawks on Sunday September 16. The Jokers of Doom continue to struggle mightily to find the back of the net, resulting in the team dropping it’s last two games 3-2 and 3-1 to the Tomahawks and Hockey Balboa after opening the season with a 3-2 OT win. In the Tomahawks game, as per the norm the Jokers fell behind early and were down 2-0 after the first period. They battled back to score the next 2 goals, Ken Herren with the lone goal scored in the second period on a power play and then just 1:43 into the third Frank Melillo tied it up. In the end the Tomahawks would break the tie mid way through the third period as Steve Lubinsky scooped a loose ball between the circles and his quick wrist shot found the 5 hole on goalie Josh Berrelli who was filling in for Matt Dutily and stopped 26 of 29 shots. In the game versus Hockey Balboa, Dutily was back in net and the Jokers were hoping to find paydirt more often but it just wasn’t to be. Once again, they found themselves down early as Balboa would score on a long shot in the first period which ended with Jokers sown by a goal. Although holding the offensive zone longer than Balboa the second period yielded no goals and another goal against for a 2-0 deficit heading the the third period. In the final frame, the Jokers would finally cash in as Tyler Salkins would tap in a rebound off a shot from Herren. The same theme would hold though as the Balboan’s cashed in another goal midway through the third and hung on for the 3-1 victory. Goalie Matt Dutily stopped 29 of 32 shots. No doubt captain Jim Brunetti will be devising new strategies to deploy in the next contest on Sunday night versus the 3-0 division leading Vipers. Notes: Jokers were 1-6 on the power play in the Tomahawks game… 37 shots for versus Tomahawks is the highest total in several seasons… 0 power plays and only 2 matching penalties in second game versus Hockey Balboa… Jim Salkins was a scratch in game 1 and Garrett Salkins was a scratch in game 2… Forward Jeff Herget was signed as a per game player and debuted vs Balboa… Despite the losses Jokers won the shots on goal in both games 37-29 and 33-32 which they hadn’t done all of last season. The Jokers of Doom finally got the spring season underway versus Chaos after game 1 of the new season was replaced with game 3 of the finals due to weather. As per the norm, the Jokers hate having leads early in games, so they gave up a goal after a Jokers turnover in their offensive zone and a quick pass and slap-shot goal by Lou Coleman. The period would end with no penalties and the Jokers out shot 11-6. In the second just 1:27 into the period Ken Herren would intercept a pass attempt between the circles and fire home a goal stick side low to make it 1-1. A couple of minutes later Garrett Salkins would scoop up a loose ball, move into the offensive zone a zip a wrist shot home from the top of the circle. This period would end with 1 penalty for Chaos and the Jokers up in shots, 9-7. The 3rd period would feature some back and forth action from both teams but the better chances coming from Chaos as Jokers backstop Matt Dutily continued to impress with many key saves. However with only 29 seconds left in the period a confusing off sides call and touch up would cause the ball to be unattended at mid-dek where a Chaos player took a long slap-shot that found it’s way past Dutily and tie the game at 2-2. The 3rd period would end with 1 Jokers penalty and a 10-7 shot disadvantage. In the overtime with just 1 minute left Josh Berrelli would take what appeared to be a harmless wrist shot from the blue line but somehow it found it’s way through the goaltender and give the Jokers an improbably 3-2 win to open the spring season. Notes: Jokers were outshot overall 32-24… now 8-1 in last 9 games dating back to last season… Tyler Salkins made his season debut joining dad Jim and brother Garrett on the team… Tomahawks (1-1) will be the opponent for game 2 on April 3. 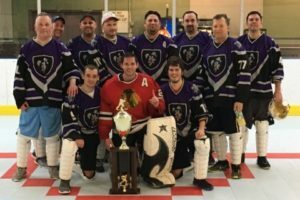 The Jokers of Doom captured their ninth dekhockey title in their 20-year history last night in a thrilling 2-1 double overtime game-three victory! This game would be a classic as the Jokers would once again fall behind early-as has been their M.O. for the entire playoffs and most of the season. The Hurricanes snuck a goal at the 3:57 mark of the second period and, minimal quality scoring chances were being generated from both sides due to solid defensive play. As the game moved to third period and the time kept winding down it was just about to get to the desperation point when Jim Brunetti fired what appeared to be a routine shot at the net but somehow it had eyes and found it’s way just across the goal line to tie the game. Josh Berrelli dished to Brunettti after Rich Orsini won the battle to keep the zone – each earning an assist on the game-tying goal. Both netminders played very well as the game moved to the first OT, Jokers goalie Matt Dutily had stopped 22 of 23 shots and the Hurricanes goalie 18 of 19. The first OT again saw a minimal amount of scoring opportunities and the shots on goal were even at four per side, the best chance being a Ken Herren wicked slap shot on a 2 on 1 break that missed the net wide to the right. Notes: Dutily would named series MVP, stopping 28 of 29 shots in the deciding game, and 24 of 25 in game two’s win… Jokers were out shot in all but one of their 14 games this season… each of the nine franchise championships have had a different goalie in net… Herren would also take home additional hardware with the most goals trophy and the most points trophy in the division… Josh Berrelli is confirmed to make an appearance at the JOD Pancake breakfast on March 24 from 9:00am-12:00pm to sign autographs… The entire Jokers team will return next season with game one coming up on March 25. Jokers Even Up Finals with 2-1 Win! The Jokers of Doom need a win Sunday night to force a game 3 winner take all matchup against the Hurricanes in the D division dek finals. They got that win in a thrilling 2-1 victory. Once again the Jokers despise having early leads so they again went down 1-0 in the first period at 5:12 on a quick slap shot goal after a failed clearing attempt by the Jokers. The Jokers would get a late power play on the only penalty of the game with 43 seconds left in the period but could not capitalize and the period ended at 1-0. In the second the game was starting to get the feel of game 1 a bit but the Jokers were only down by one goal. The next goal of the game would be critical and the Jokers tied the game with only 30 seconds left in the period. Garrett Salkins would pick up a loose ball near the center line, take a few steps into the Hurricanes zone and fire a laser beam like wrister into the top left corner of the net past a stunned Canes goalie. A huge goal to lift the team and give some high motivation to get another in the 3rd period. In the third period the game was tense as the next goal could decide the game and also the championship. Both teams were careful not to give up too many good chances when out of nowhere Josh Berrelli streaked down the right side and with not much of angle fired a quick shot over the goalie into the top of the net. Another crucial goal gave the Jokers what they needed to hold off the furious Hurricanes rush and preserve the win and tie the series at one game a piece. Matt Dutily was the star of this game as he made several key saves including a highlight reel stop in the third period on what seemed like an open net as he reached out and deflected a shot with the blocker. He ended the game with 24 saves as again the Jokers found it tough to generate shots with only 16 of their own. The deciding game 3 is set for Wednesday evening at 9:00pm and is sure to be a great contest.